We are constantly “on”, checking social media, available to answer work calls and even willing to drop everything in order to keep FOMO at bay. 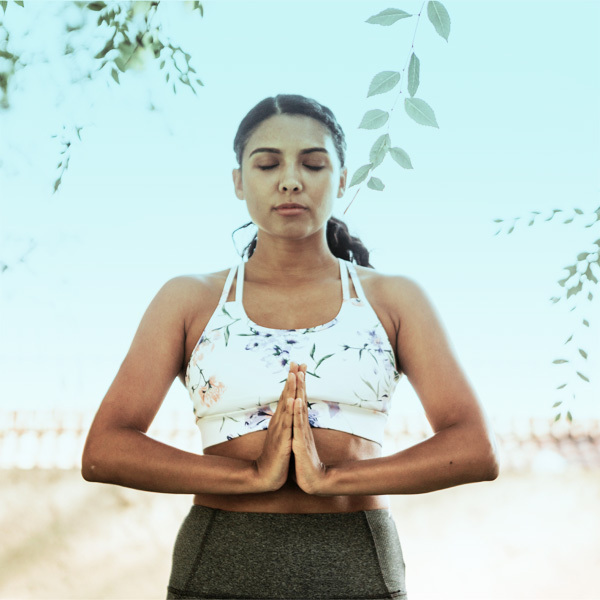 Using the ancient practice of yoga, we can go back to our roots of a holistic approach to living, free of stress and anxiety. The philosophical teachings pf yoga underpinning the physical practice are known as the Yoga Sutras, the Ten Commandments of yogi living. They encourage us to adopt concepts like non-harming (ahimsa) and tapas (discipline) not just in the postures we adopt on the mat, but also into our actions, words and thoughts off the mat, approaching ourselves and the world around us with care and kindness. These five yoga teachers around the world reveal their personal recommendations and postures for self-care. Why not try it for yourself? It’s more about balance than striving for perfection. I take care of my body through movement and eating well, but it’s equally important that I have space to enjoy dessert and wine without guilt. As a working mother and self-care for me these days involves both quality time with my daughter, without distractions, and time for myself at the end of the day. I take a lot of baths and, of course, practice yoga. For restoration I always come back to Viparita Karani, legs-up-the-wall pose. It calms the nervous system, helps ground you and is also great for lower back and neck pain. It doesn’t require any “doing”; it’s a passive pose you can completely relax into without thinking. Many things we do on the mat require coordination and focus; this pose does not. Just stay aware of the breath and let yourself be. For me self-care means being responsible for myself – practising patience and taking care of myself emotionally as well as physically and mentally. Knowing how I feel is really the seed of all that. How can I take care of myself if I don’t know how I feel? I’ve recently realised how much I feel in my body physically – even my emotions create physical reactions – and often when I am unhappy, it is due to a physical discomfort that comes from emotional distress. What is the resolution? Attention. In the morning (or any time) I sit quietly and scan my body inch by inch from head to toe. As I sit and meditate on my body, I notice the sensations that are present and give every inch of my body some attention. I do this for five to 20 minutes, and then I check in with myself emotionally. I write a list – three things I am grateful for, three things I did well that day and three things I can let go of or have no control over. One thing I’ve come to learn is that burnout doesn’t come from overworking, it comes from not resting when you have the time – you end up addicted to the dopamine rush. I like to meditate for 10 to 20 minutes a day, incorporate some form of movement (a workout or surf) and a stretch. A book and a cup of tea is now a daily ritual. Most of the time, I don’t want to stop, I’d rather charge and keep going, but I know I need to. Finally, I take some time to be present with nature and experience love as a feeling, not needing to direct it towards anything. Appreciate life as it is, not how my mind makes it. I practice yin yoga when I wake up. Each morning I take four to six poses to forward bend, backbend, laterally bend, twist, externally rotate my legs and do lots of combination postures. The energetic release I feel is intense and each pose leaves me feeling like I have regained full range of flexibility with abundant energy flow. It’s not vigorous, but it’s perfect to get you ready for vigorous exercise. It’s a great way to get in touch with yourself and sets you up for an amazing day. Self-care for me is about taking care of myself on all levels. The body needs to be nourished and exercised so that it does not get too affected by diseases and age-related problems. The mind has to be channeled in the right direction so that we are not affected by the different triggers and negativities of daily life. The spirit, which is the source of our being, also has to be nurtured. If we ignore any of these aspects, we experience imbalance and disharmony. My favourite posture for self-care is surya namaskar (sun salutations). It helps to move every part of the body and activates all the energy chakras. It’s a complete workout, too. Maintaining a balance between my physical, emotional, mental and spiritual wellbeing is self-care for me. It’s about having a consistent yoga and meditation practice, but also having spare time set aside to spend alone and with loved ones. Living halfway across the world from my family and friends, it’s easy to lose touch with people. So right now my self-care also involves regularly reaching out to friends and family to check in with them and see how they’re doing. Picking up the phone to hear the voice of a good friend or my mum and dad is a great way to start or end the day off on a good note. My favourite posture for self-care is trikonasana, triangle pose, a standing pose with legs apart, right foot turned slightly inward and arms raised parallel, going forward and down, resting the back of the hand on the inside of the thigh or shin, reaching the right arm straight up. I love the way it lengthens out my entire body, and holding it for several deep breaths always makes me feel great. It’s a pose that isn’t too physically intense, so I can incorporate it into any daily yoga practice. Use yoga as a form of self-care by creating an at home practice. Check out Yogaholics online yoga classes here and start your journey today.